As the bloody Taiping Rebellion (1850-1864) spread from the south, a branch of the Triads known as the Small Sword Society (Xiao Dao Hui 小刀会 – named after the daggers they used in close combat) decided to take advantage of the situation with a power grab. After capturing Amoy (today's Xiamen) in 1853, a small body of the rebels advanced to Shanghai. That year the Autumnal Sacrifice to Confucius fell on September 7, and when the gates of the walled Chinese city were opened early that morning, 600 men rushed in with the crowd, storming the Imperial offices, putting the city magistrate to death and the Taotai under house arrest. Their leader, Liu Lichuan, who had established the Society in Shanghai a few years previously, was an emaciated, opium smoking Cantonese ex-sugar broker. He spoke some English though, and proved capable - making peace and trading with the International Settlement (which the Society did not invade). Realizing they needed to cut off this supply, Qing imperial forces eventually built a huge wall blocking access to the Chinese city. Isolated and under attack, the rebels evacuated on February 17, 1855, having occupied the city for 17 months. The imperial troops spent three days looting, almost entirely destroyed the eastern half of the city with fire, while any remaining rebels captured were executed on the spot. 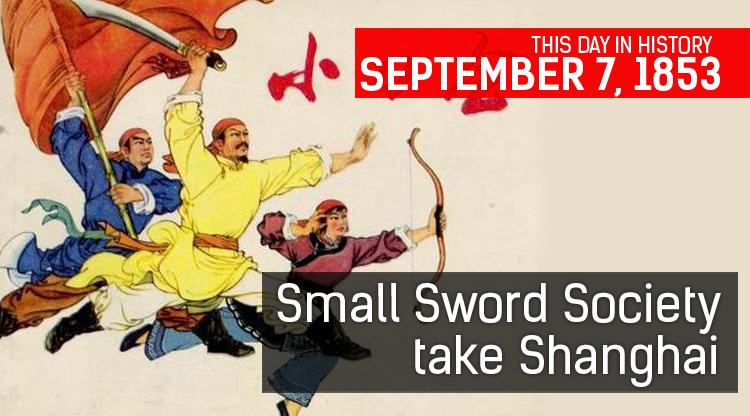 A museum about the Small Sword Society's occupation of Shanghai can be found at their former command post - Dianchun Hall.